In cooperation with the Natural Lands Trust, the NJDEP Division of Fish and Wildlife has created a series of "paddling trails" along the Delaware Bayshore for the public's enjoyment. These trails were made possible through a National Recreational Trails grant administered by NJDEP's New Jersey Trails Program and provide for a unique outdoor experience. 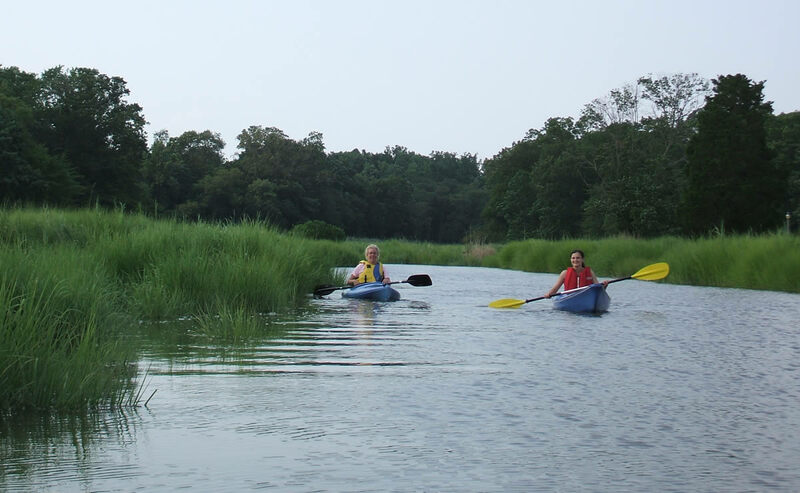 Explore the rich environment of the salt marsh and view wildlife from your canoe or kayak as you meander through these public and private protected properties. Below is information to help you safely enjoy all that these trails offer. Only you can ensure your safety by being prepared and knowing your limitations! 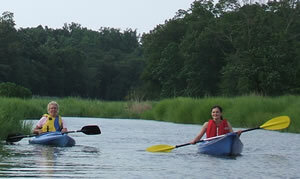 If done safely, canoeing and kayaking are wonderful ways to experience the Delaware Bayshore. When you paddle, please follow the following tips. Water conditions vary from day to day and season to season. It is up to you to be prepared. Check the weather forecast, tidal conditions, moon phase, and water levels before you leave. Tides, winds and the phase of the moon will affect paddling conditions. Tides can rise or fall 5 ft. within 6 hrs. on this marsh. Give a reliable person your Float Plan (pdf, 8kb) with information about your destination and intended time of return. Leave a copy on your vehicle's dashboard. Allow at least an hour of paddling time for every two miles of trail. Tides and winds can significantly affect the difficulty of your trip. Avoid paddling in high winds or during extreme tides. Always wear a U.S. Coast Guard approved personal flotation device (PFD) with a whistle attached (children under 13 must wear PFDs when boats are not beached, tied-up or anchored). Carry a map of the trail or navigation chart so you can find your location at any time. Refer to it often. Bring a cell phone. Cell phone coverage is sporadic so have a contingency plan just in case. A hat, sunglasses and sunscreen are recommended, even on cloudy days. Wear protective foot wear and proper clothing designed for water recreation. Bring insect repellant from May to October. Bring plenty of drinking water and snacks in non-breakable containers. Know about hypothermia and how it can affect you. Bring a change of clothes to leave in your vehicle. Take a bag to hold your trash for proper disposal when you leave the water. Visit Leave No Trace (www.lnt.org) for more information. In an emergency, stay with your canoe/kayak. Crossing the marsh on foot is difficult. Shift your weight carefully as you push off with your paddle. Watch for motorboats. Stay to the right and turn into their wake. There are no restroom facilities along the trails. Share the water; when approaching anglers or other paddlers, give them a wide berth and proceed quietly so as not to interfere with their recreation. Respect wildlife. Do not approach or harass wildlife and never feed them. Launch: End of Turkey Point Rd. Launch: End of Hansey Creek Rd. Launch: End of Berrytown Rd. NOTE: road can be rough and frequently floods at high tide. Unload, then park on higher ground. Each trail can be paddled as a loop or combined with other trails for a destinational paddle. Each trail is marked with colored poles. 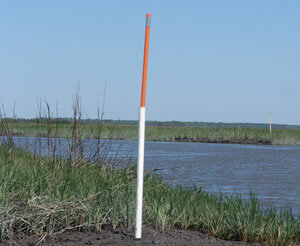 Poles are usually placed close enough to see the next pole in the distance. Stay alert at creek intersections to avoid taking a wrong turn. Each waterway is rated based on calm weather and water conditions, appropriate level of paddling experience and length of trail. All these trails require intermediate to advanced skills under calm conditions. Understand that tidal waterways do not always fit into one category of difficulty and may change due to fluctuations in the water levels and rate of water flow due to tides, wind, lack of access points, inclement weather, or other disturbances and obstructions. The paddling times are estimates only (speed 2-3 mph). Wind, tide and ability can have a tremendous affect on your actual time. Leave plenty of time to complete your paddle during daylight. Be aware that paddling up side creeks and guts on a falling tide could leave you stranded in the mud. Crossing the marsh on foot is difficult. The Glades Wildlife Refuge is a 7,500-acre expanse of diverse landscapes owned by the Natural Lands Trust (www.natlands.org/), a non-profit conservation organization serving southern New Jersey and eastern Pennsylvania. The Glades encompasses vast tidal marshes, wooded uplands, Delaware Bay beaches, and old growth forest. The Glades Refuge was once part of southern New Jersey's agricultural and maritime economy. Crumbling foundations and fields reverting to woodland are evidence of former agriculture. Farming, fishing and crabbing remain popular activities outside of the preserve's boundaries. The Glades is a haven for wildlife, providing year-round habitat for many ducks, marsh birds, hawks, bald eagles, and various upland birds as well as fox, deer, otter, and other mammals. The area is also an important wintering place for snow geese and a crucial habitat for migratory shorebirds in the fall and spring. Look for these creatures as you paddle. Look for rails, mussels and fiddler crabs at the edge of the water, and egrets and herons in the marsh. Bald eagles, northern harriers, red-tailed hawks, and many species of terns and gulls may be seen while paddling. Thousands of snow geese and other waterfowl frequent the marsh in fall and winter. One project of PSEG's Estuary Enhancement Program is the Commercial Twp. Wetland Restoration Site (www.pseg.com/info/environment/estuary.jsp, pdf, 3mb). Once a salt hay farm, the site includes the preservation of upland buffer habitat and the enhancement of 2,900 acres of previously diked wetlands. The area provides important wintering habitat for waterfowl, crucial migratory habitat for shorebirds in the fall and spring, and spawning and nursery habitat for fish. A paddle through this area at low tide in the spring or fall will reveal thousands of shorebirds feeding on the mudflats. This is also a favorite feeding and resting spot for teal and other waterfowl. Diamondback terrapins bask on the shore. 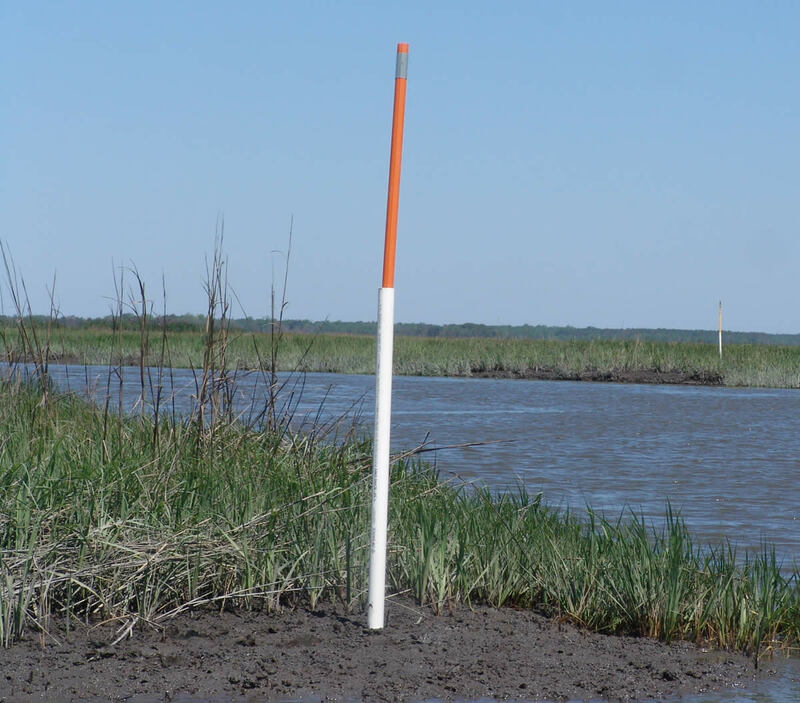 Look for rails, raccoons, mussels and fiddler crabs at the edge of the water, and egrets and herons in the marsh. Bald eagles, northern harriers, red-tailed hawks, and many species of shorebirds, terns and gulls fill the sky. Look for these creatures as you paddle. Clicking on the name of the launch point below will open a Google Maps window or tab showing the approximate location.